Do you allocate for annuity or other bond-alternative strategies? Are you open to risk/performance ideas for your asset allocation models? 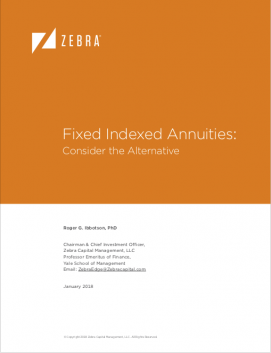 A first of its kind from industry guru Roger Ibbotson, this whitepaper focuses on uncapped Fixed Indexed Annuities (FIAs). When structured appropriately, FIAs can control market and longevity risk, and can outperform bonds. Find out why an FIA is such an attractive alternative in today's climate.